Special Collections at the University of Southampton holds rich resources for the study of the political, social and cultural history of Ireland. There are substantial collections of manuscript papers relating to the Irish estates of the Temple and Parnell families, particularly in Sligo and Dublin (MS 62 Broadlands Archives and MS 64 Congleton Manuscripts); and much political material in the papers of the first Duke of Wellington (MS 61). The papers of the Earls of Mornington (MS 226, MS 299), and the papers of the family of Richard Wellesley, first Marquis Wellesley (MS 63 Carver Manuscripts) also contain complementary material on estate management. The Rare Books sequence in Special Collections extends to approximately 4,000 items, ranging in date from the late 15th century to the 20th century. A number of these books were published in Ireland, or provide an insight into Irish history. 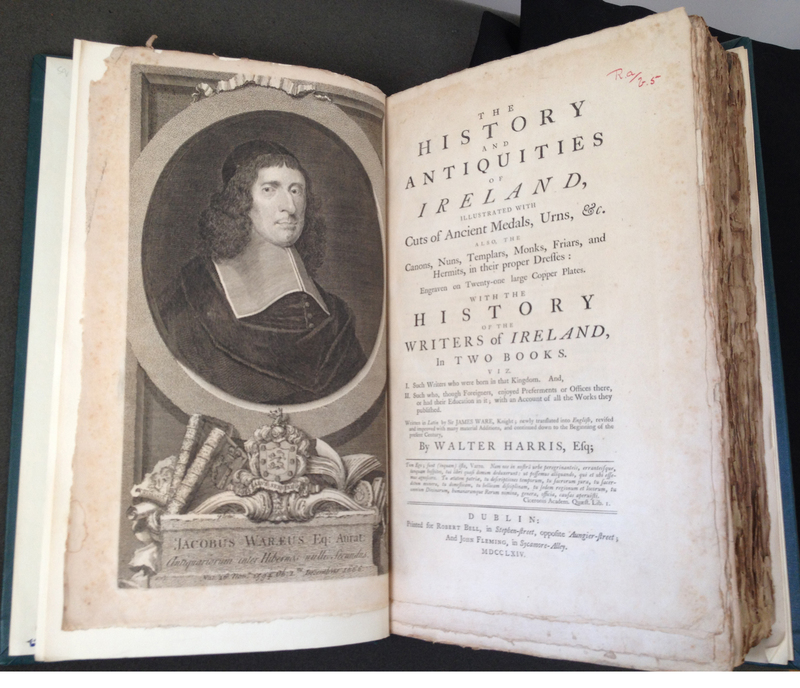 The title page, above, is from The History and Antiquities of Ireland, Illustrated with Cuts of Ancient Medals, Urns, &c..: With the History of the Writers of Ireland… Written in Latin by Sir James Ware; Newly Translated into English, Revised and Improved… And Continued Down to the Beginning of the Present Century, by Walter Harris, Dublin (1764) Rare Books DA 920. Irish matters were strongly reflected in the political, social, and economic questions facing Great Britain in the first half of the nineteenth century. The Wellington Pamphlets, which were presented to the first Duke of Wellington by authors and interested individuals, are a valuable source for contemporary views. They date from the late 18th century to the mid-19th century and number more than 3,000 items. Hundreds of these pamphlets relate to Ireland: and they cover a wealth of topics, from agriculture, drainage, and land improvements; to the condition of the Catholic and Protestant churches; Catholic Emancipation; harbours, trade, and industry; schools and education; distress, emigration, dissent and rebellion; reform; elections; government and law; poor law, poor rates and relief; medical relief and reform; and public health – to name a few. Walter Frank Perkins (1865-1946) gifted the Perkins Agricultural Library of books on agriculture, botany and forestry to the University College of Southampton, and published the bibliography British and Irish Writers On Agriculture in 1929. His collection of some 2,000 books and 40 periodicals, ranges in date from the 17th century to the late 19th century. It includes varied works on the condition of Ireland and Irish farming, for example, on the cultivation of crops such as potatoes, flax, and grasses; concerning Irish peat and turf bogs; Irish manufactures; population; and poor houses. 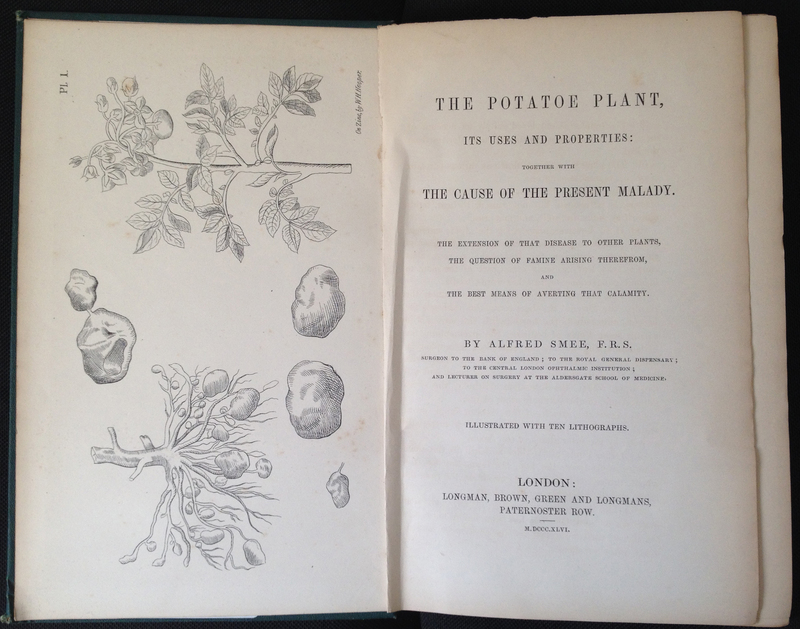 Above is the frontispiece to Alfred Smee’s The Potatoe Plant, Its Uses and Properties: Together with the Cause of the Present Malady.. London (1846) Rare Books Perkins SB 211.P8. 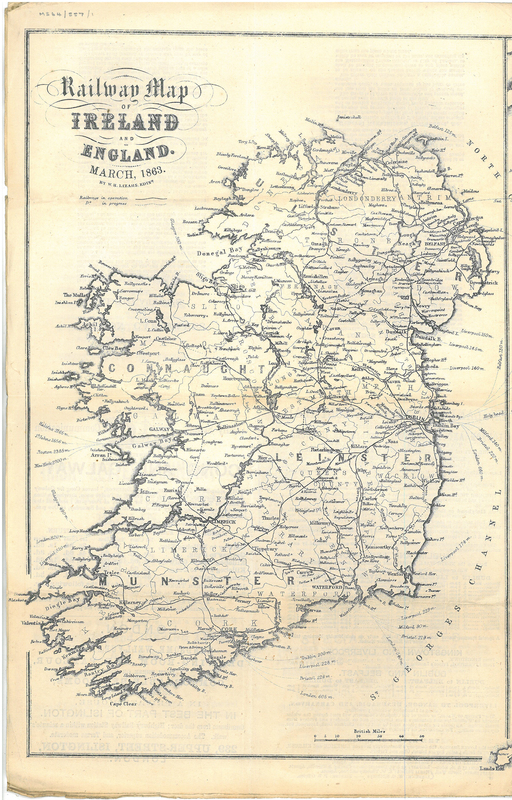 Other interesting printed material relating to Ireland can be found in our manuscript collections, such as this printed map of Ireland, dated 1863, part of the Congleton Manuscripts (MS 64/557/1). 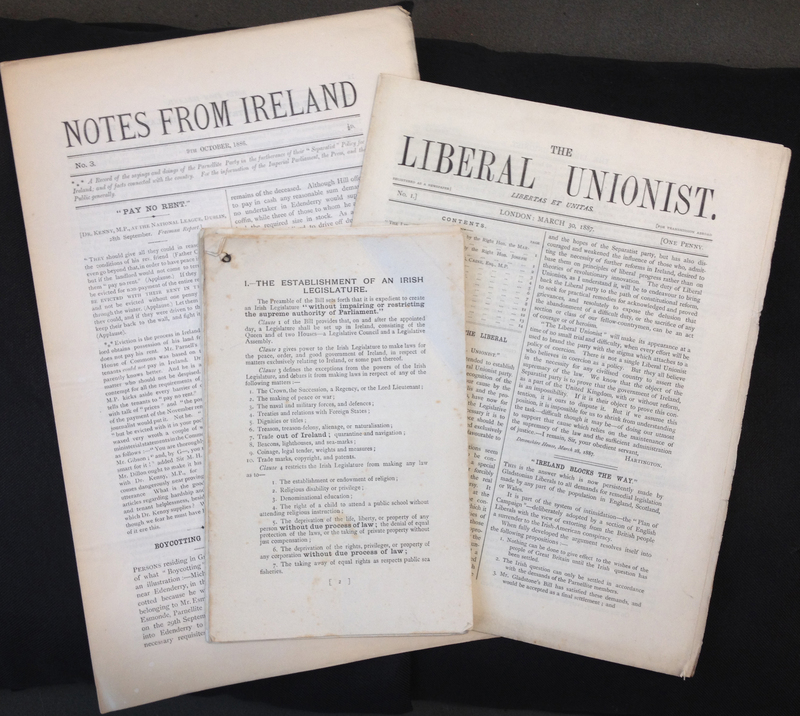 Irish political periodicals feature in the papers of Evelyn Ashley, M.P. (1836-1907) as part of the Broadlands Archives (MS 62 BR61; BR148/12). Evelyn succeeded to Lord Palmerston’s estates at Broadlands and Romsey in Hampshire, and Classiebawn, County Sligo, in 1888. A Liberal M.P., he was defeated in the election for the Isle of Wight in 1885, and joined the Liberal Unionists when Gladstone announced his adoption of the principle of Home Rule in 1886. He unsuccessfully fought seats in a number of later elections and retained a close interest in politics until his death in 1907. Evelyn’s personal copies of these periodicals are an interesting source for the political questions of the 1880s and 90s. Notes from Ireland “A Record of the Sayings and Doings of the Parnellite Party in the Furtherance of their “Separatist” Policy for Ireland; and of Facts Connected with the Country. For the Information of the Imperial Parliament, the Press, and Public Generally”, survives for the years 1886-1891 (MS 62 Broadlands Archives BR 61/3/4, BR148/12). The newssheet had been established in 1886 and was published by the Irish Loyal and Patriotic Union. Evelyn’s copies of The Liberal Unionist survive for the years 1887-1892 (BR61/3/6). The other item pictured here is a printed version of the (second)Home Rule Bill, dating from c.1893. 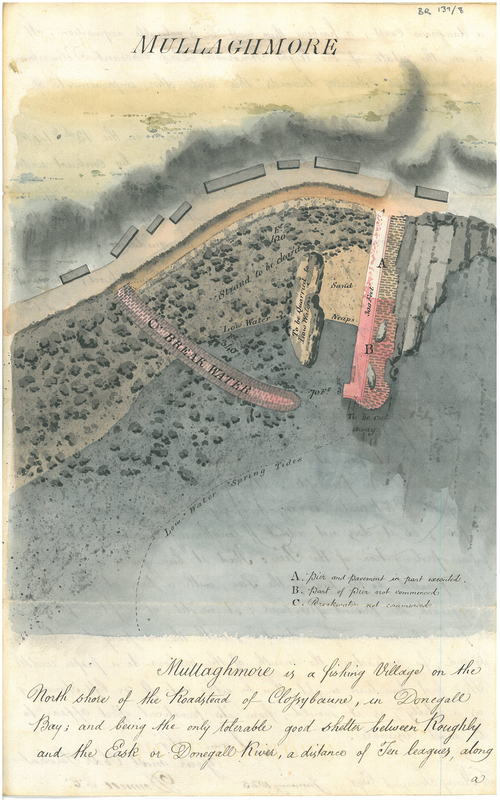 For details of our related manuscript sources for Ireland see our online guide: Sources about Ireland: Information Sheet. 21 October has become celebrated as Apple Day. Launched in 1990 by Common Ground in Covent Garden, the aspiration for this was to celebrate and demonstrate the variety that is in danger of being lost, not simply in apples, but in the richness and diversity of landscape and ecology. Apples have been cultivated for centuries: Pliny records details of sweet and culinary apples grown by the Romans in Italy. Whilst there is evidence that apples were grown in Great Britain in the Neolithic period, it was the Romans who introduced new sweeter tasting apples. After the withdrawal of the Romans from Britain, many orchards were abandoned as the countryside was beset by raiders. It was only in the wake of the Norman Conquest that apple growing was revitalised and new varieties of apples were introduced from France. During the thirteenth century, several kinds of apples became established in Britain, often grown in orchards attached to monasteries. In the sixteenth century Richard Harris, the chief fruitier to Henry VIII, introduced a number of new grafted varieties, including the famous Pippins and developed modern-style orchards in Kent. Herefordshire orchards were augmented by the best cider apples from France by Lord Scudamore, British ambassador to France during the reign of Charles II. The more scientific cultivation of apples, however, did not occur until the late eighteenth century. Seen as the most valuable and generally cultivated of European fruits, the apple was considered by Dr Thomas Andrew Knight “not the nature produce of any soil or climate, but owes its existence to human art”. The work on pollination undertaken by Knight, who was President of the Horticultural Society of London, led to improved varieties. It was to influence the work of others gardeners throughout the nineteenth and twentieth centuries. Until the eighteenth century fruit plants had been an essential part of the landscape in gardens on large estates. However with the swing from Renaissance formality to a more “natural” look, the cultivation of fruit and vegetables was moved to the, usually, walled kitchen garden. Owners were proud of their kitchen gardens both for their layout and display and considerable effort was taken with the cultivation and development of fruit varieties. The kitchen garden at Broadlands House in Romsey was developed in the eighteenth century and the design of it showed an appreciation of the ascetics as well as the productivity and the variety of fruit to be grown. Fruit was an essential part of the diet in a household and would be used to impress guests with unusual varieties. The Italian practice of fresh fruit at the end of a meal became the height of fashion in the nineteenth century. 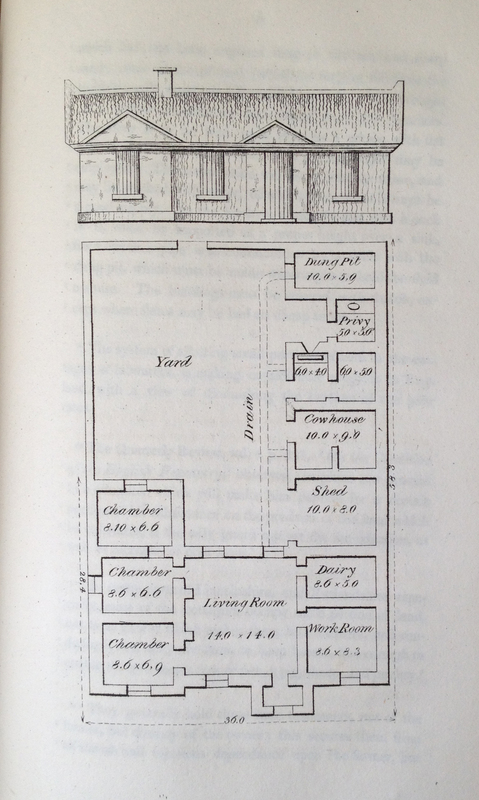 The Perkins Agricultural Library at the University contains a range of books that reflect this interest in both the planning and cultivation of kitchen gardens and the craft of growing fruit trees. 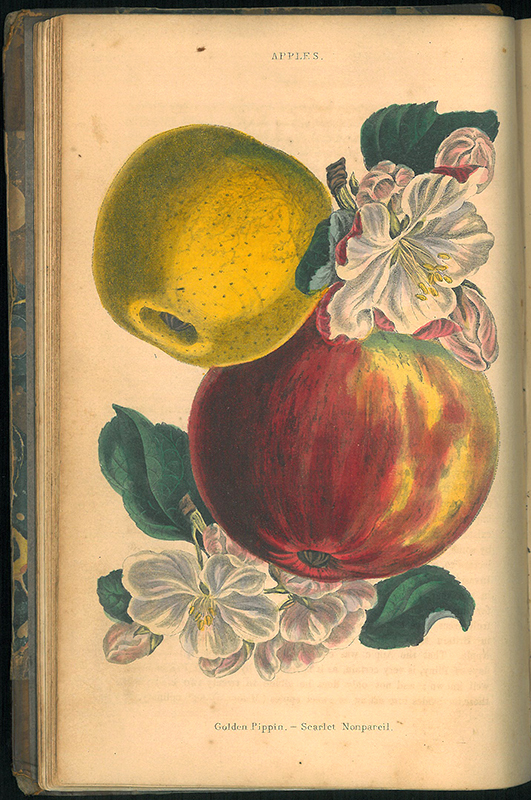 Guides on the development and successful propagation of fruit plants include Dr Thomas Andrew Knight’s A treatise on the culture of the apple and pear and on the manufacture of cider and perry (London, 1818); William Forsyth A treatise on the culture and management of fruit trees ( London, 1803) and Charles McIntosh The orchard (London, 1839). In addition to practical advice provided in such works, others such as The Complete family piece provided recipes for medicinal cures and for cooking. 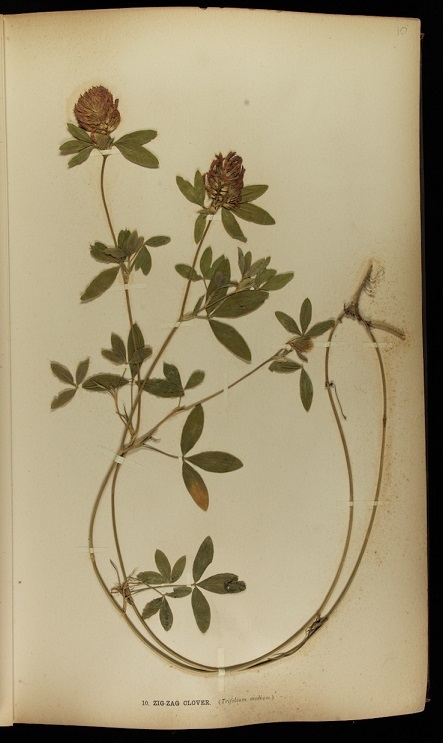 While it is not uncommon to find pressed flowers within the pages of an older book, finding books in which plant specimens were part of the original publication is relatively unusual. The Perkins Agricultural Library is fortunate in having seven such books of dried grasses, ranging in date from 1790 to 1896. The publications resulted from the ongoing drive to improve the quality of pastures in order to support more livestock; farmers needed to be able to identify pasture grasses accurately and for this purpose dried plant specimens were preferred to botanical illustrations. Only one author mentions in any detail the practical problems involved in producing such a book. In his introduction to Natural Illustrations of the British Grasses (Bath, 1846), which contained sixty-two specimens, Frederick Hanham wrote that 62,000 plants had to be collected and prepared, with half as many again to ensure successful specimens. Not surprisingly he described the undertaking as involving “no slight or ordinary anxiety and exertion”. Broadly similar in aim, the books differ in approach. In John Milne & Sons’ British Farmer’s Plant Portfolio (1896) there are only a few pages of written description, but the grass specimens are superb and well displayed. David Moore in Concise Notices of British Grasses Best Suited to Agriculture (1851) also includes tables of the quantities of seeds of different grasses required for various purposes, whilst Hanham’s Natural Illustrations of the British Grasses (1846) is an altogether different undertaking. As well as describing the plants, he also includes “instructive and appropriate extracts from the best authors”, and hopes that the reader, through nature, may look to nature’s God. 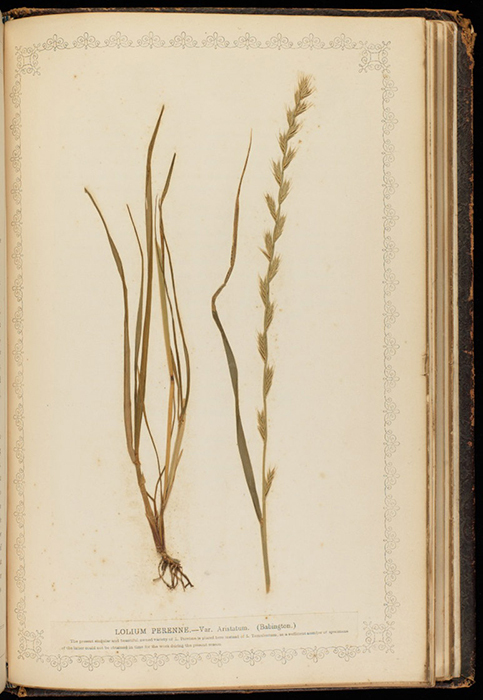 Hortus Gramineus Woburnensis (1816) by George Sinclair is the only book of the seven to report the results of experiments involving grasses, in this case a comparison of the nutritive qualities of grasses sown on different soils. This lavish folio volume is also unusual in containing dried seeds as well as dried grasses. In his introduction, Sinclair wrote that the scientific study of grasses had been neglected in favour of other branches of agriculture – exactly the same opinion being expressed by Milne some eighty years later. We do hope you enjoy taking part in National Meadows Day and perhaps you will participate in events identifying some of the grasses on view in these neglected habitats. Over the holiday season many of us have indulged in a range of winter comfort foods and festive treats, from turkey and sprouts to mince pies and puddings. In the lead up to the Christmas break visitors were invited to Special Collections for our third and final Explore Your Archives event of the year, with the focus of the afternoon being (somewhat appropriately) food! 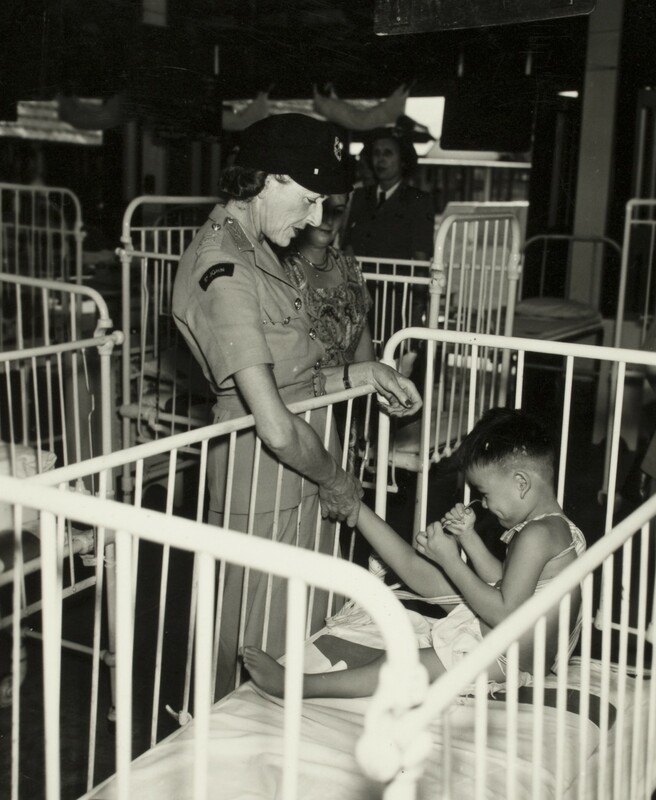 The material on display covered areas such as the cultivation of food, food preparation, household management, food supplies, consumption of food (including some fine dining), and food relief. 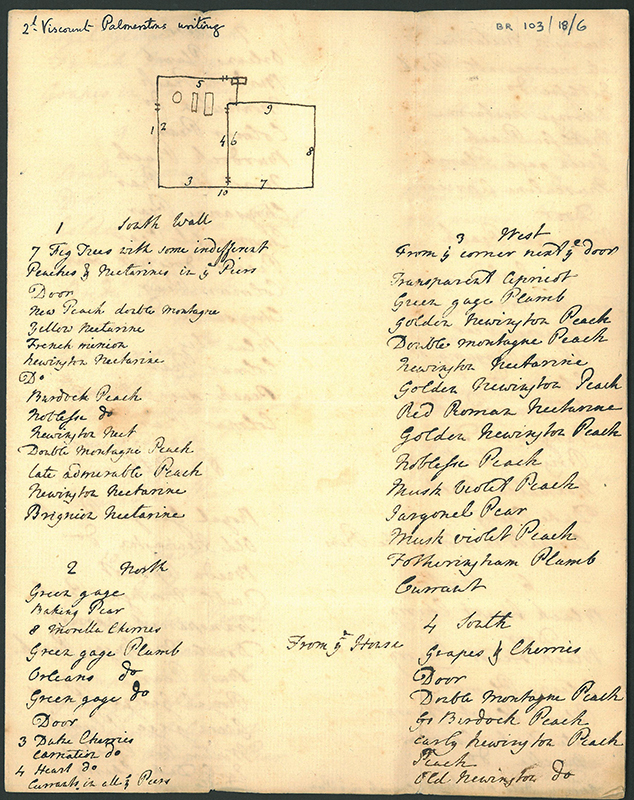 Beginning with a section on cultivation, one of the first items was a plan and catalogue for trees in the kitchen gardens at Broadlands from 1769 which, incidentally, coincided with work done on the estate by ‘Capability’ Brown whose 300th anniversary will be celebrated later in the year. 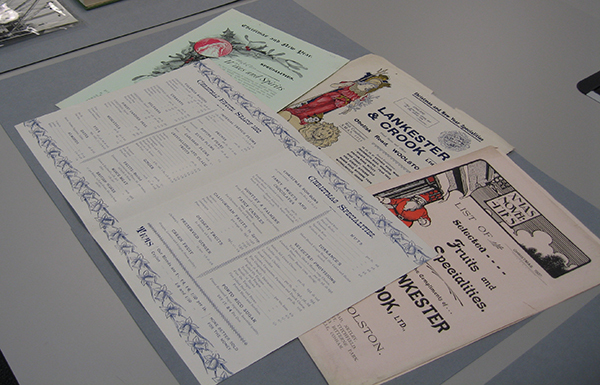 This was followed by a selection of material relating to the management of crops and livestock. The United Nations has declared 2016 the International Year of Pulses, with the aim being to “promote broad discussion and cooperation at the national, regional and global levels to increase awareness and understanding of the challenges faced by pulse farmers, be they large scale farms or small land holders.” As the planet’s population continues to increase, pulses such as beans, lentils and peas, are recognised as a sustainable crop which provide a low-fat source of protein, fibre, vitamins and minerals. A highlight from the selection of cook books and recipes was Florence Greenberg’s classic Jewish Cookery Book. First published in 1947, the book proved hugely popular with post war Anglo-Jewish households, bringing a mix of British and continental cooking. She described the Jewish influences as being seen clearly in the fish dishes, sauces and puddings. There were also many examples of fine dining drawn from the papers of third Viscount Palmerston, Lady Swaythling, Lord Mountbatten, and W.W.Ashley and Cunard cruise ships, including menus, dinner books, and letters reporting on dinner parties and social gatherings. In contrast, somewhat less savoury culinary descriptions were to be found among the journals of William Mogg. Written during his time on Captain Edward Parry’s expeditions to the Arctic in the 1820s, Mogg describes methods used to thaw the crew’s frozen supplies — leaving them in a fire hole for three days — as well as the Christmas festivities enjoyed by the crew. 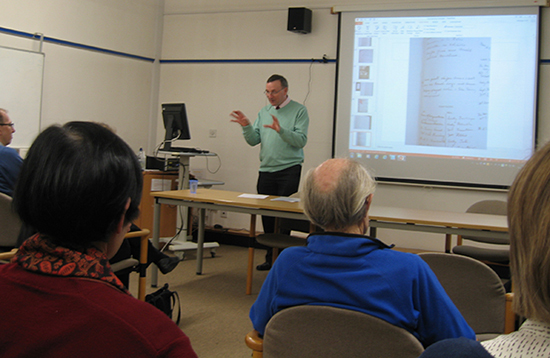 The visit to Special Collections was followed by a talk by Chris Woolgar who provided a highly engaging and comprehensive analysis of a number of the items on display. The evening was then rounded off with some tea and seasonal treats! As we plan events for the year ahead we would like to thank everyone who attended our open afternoons over the past few months. Details of forthcoming events will be announced on our blog and website in the near future. We hope to see you in Archives soon! Although well-known in agricultural history circles the Perkins Agricultural Library remains something of a hidden treasure within the Hartley Library’s Special Collections. The Perkins Digitisation Project aims to remedy this by both increasing awareness of the collection and improving access. Catalogue records for the books are being added to WebCat, and these will contain links to freely available digital copies. 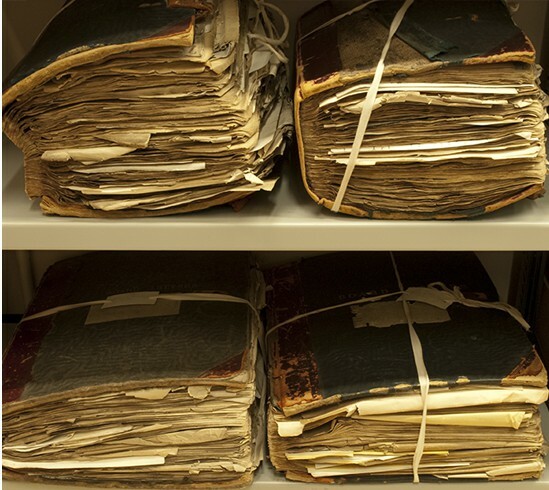 Where none can be found, the Perkins books will be assessed by Conservation staff, and condition permitting, digitised by the Library Digitisation Unit. The online copies will be made available through WebCat and the Internet Archive’s Biodiversity Heritage Library. 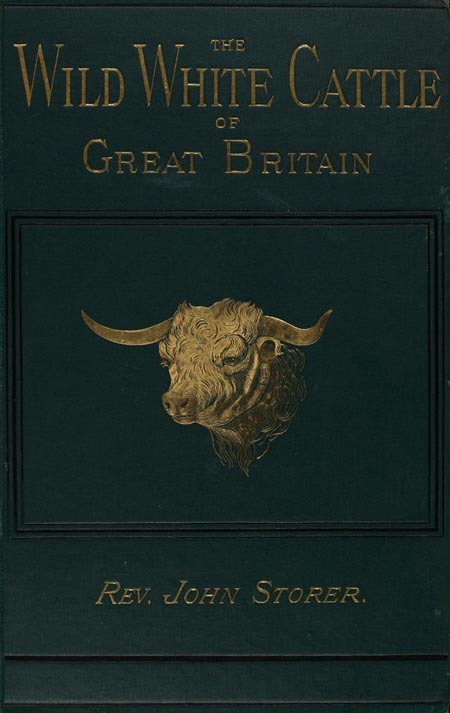 Consisting of 2,000 books on British and Irish agriculture printed before 1900, the collection was presented to the University College of Southampton in 1946 by Walter Frank Perkins, an Honorary Treasurer of the College and a former M.P. for the New Forest. Perkins collected a wide range of books on farming, including practical handbooks, textbooks, studies of crops and livestock as well as books on the development of agricultural chemistry. 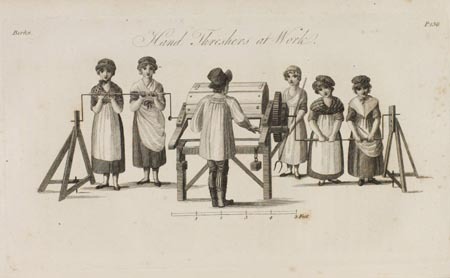 Initially the digitisation project will focus on nineteenth-century publications, online access to earlier titles already being available through the subscription services Early English Books Online and Eighteenth Century Collections Online. The areas to be targeted have been identified with the help of Dr Malcom Hudson and Dr Nazmul Haq from the Faculty of Engineering and the Built Environment, and include pamphlets on the economic aspects of farming and studies of individual crops. Many of the books contain information of potential interest today on crop varieties, yields achieved and environmental conditions of the time. 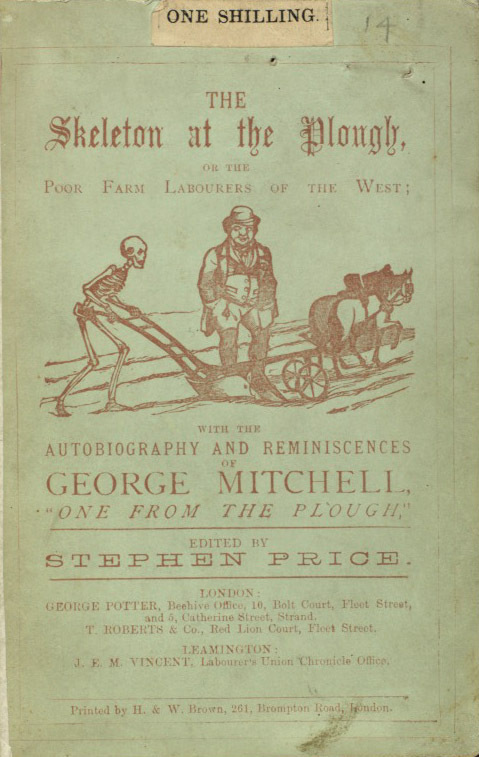 The agricultural handbooks also have value as historical sources, describing contemporary agricultural practices and various aspects of rural life. The series of county agricultural surveys sponsored by the Board of Agriculture between 1793 and 1817 is especially important in this respect. 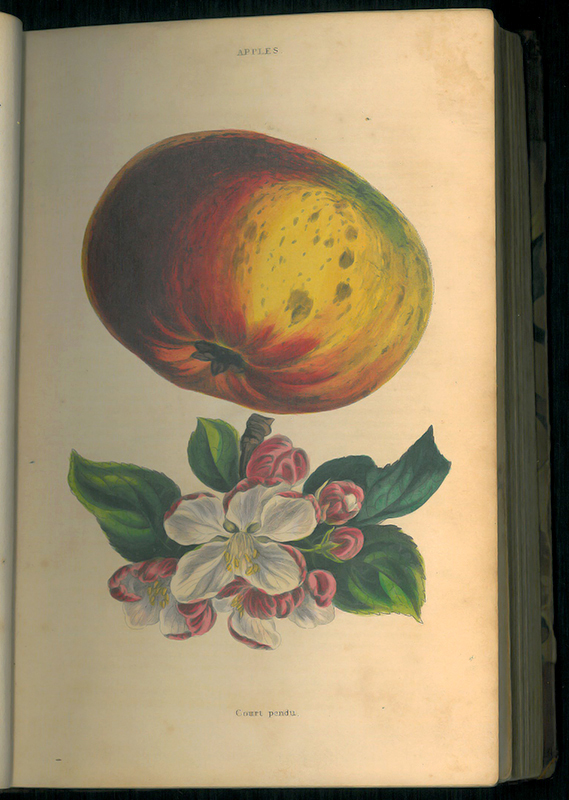 Perkins clearly preferred to collect books in a pristine condition, but some still show traces of their previous owners – annotations include recommendations of the best cider apples to grow and recipes for horse powders. Samples of alpaca wool are the most unusual find to date. 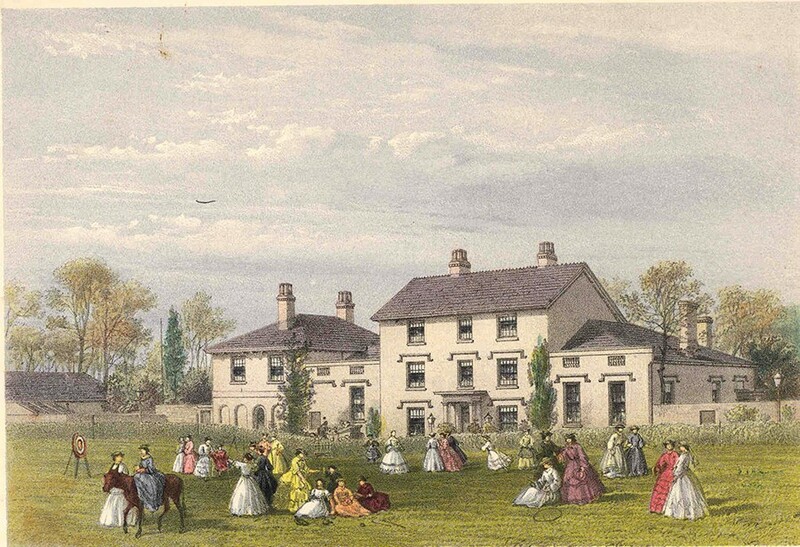 They accompany a letter dated 1846, from William Danson of Liverpool, asking the recipient to consider using alpaca in the manufacture of velvet, and are found within William Walton’s A Memoir Addressed to Proprietors of Mountain and other Waste Lands, … on the Naturalization of the Alpaca (1843). For information about the collection and how to access it see the Library website and the digitised books can be seen on Internet Archive.